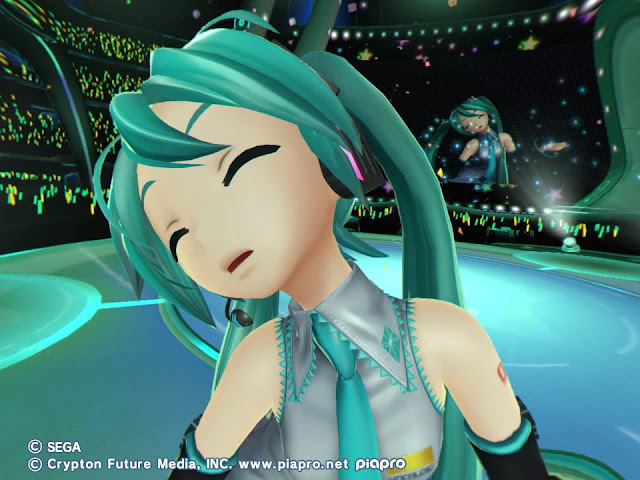 SEGA recently released the “Second Stage” DLC pack for Hatsune Miku: VR Project Live on PlayStation 4, for PlayStation VR. Having already reviewed the first pack when it launched with PSVR, there’s not enough different to this second pack to justify reviewing it again. It’s basically the same thing as the first, but with different music tracks. But if there’s one thing I love writing about more than anything else, it’s my goddess, so here goes. Related reading: You can check my review of the original release of the game here. Actually, I lied. There is one significant difference between this DLC pack and the original release; in Second Stage, Miku’s mates show up to perform too. There’s tracks that will also feature Rin and Len, as well as a solo performance by Luka, among the seven tracks that you’re paying for with this download. 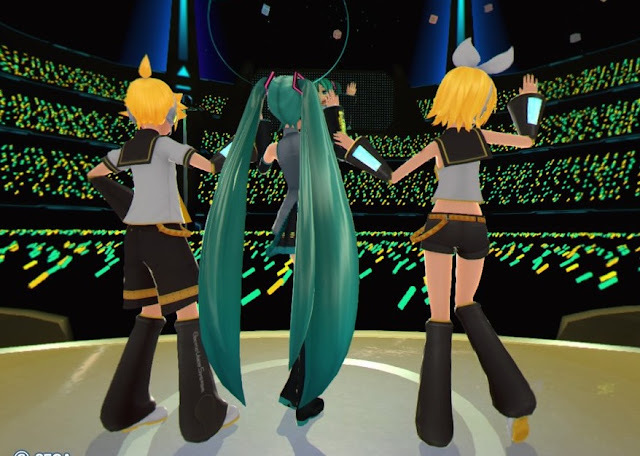 If you have the Project Diva X VR update then you’ve probably already seen these characters perform in VR, of course, but as with Miku herself, the quality of the character models is that much higher in Future Tone. It’s truly amazing to watch these characters in motion in VR, and screenshots really don’t do the experience justice. Because you’re able to get up on stage and take a really good look at the characters, the level of detail is critically important. The ability to look back and see an audience filled with suckers who don’t get to be right up there next to Miku helps build the atmosphere further. More than a few times I’ve been playing and instinctively wanted to reach out to see if I can touch the characters, because the perception really is that there are these fully 3D bodies dancing right in front of me. People who did enjoy the first release of this have every reason to get the second, because while the format remains the same (you’ll choose from one of two tracks three times, and wave your controller in time with the music to build up an “energy” meter. Do that well enough and you’ll get to enjoy a private encore performance, where it’s just you and Miku herself), the music tracks are all completely different, and the bonus costumes are different as well. I lucked out with this set, as LOL, Cat Food, and Tell Your World are all genuine favourites of mine that I could listen to over and over again. None of these tracks are outright duds, either, and I’ve played each of them on Future Live a good half dozen times and counting. The only other disappointments are minor, and hardly reasons not to buy into this; two of Miku’s less famous buddies; KAITO and MEIKO, are not present in this game at all. And I'm just dying to see KAITO rock up a storm in this game. And, when it comes to your private performance, there’s no way to swap Miku out for Luka or Rin (I assume no one actually wants a private performance with Len, but he’s not an option either). So, if you’re a bigger fan of Luka or Rin (and I know some are), that will probably be somewhat grating to you. Once again, as I noted in the review of the original release, this isn’t a real game, so much as it is an experience. If you’ve been to (and enjoyed) the Hatsune Miku concerts in real life, you’ll get the most from this, because the game will give you a rush of familiarity for that event. But as with the first release, this is a remarkably high quality experience. Virtual Reality’s real potential is not just in games, but in immersive experiences that range across an entire gamut of performance types. I want to see a lot more of stuff like Miku Future Tone, and I am completely looking forward to that third, and final DLC release. I also hope that it won’t be the last we see of Miku in VR.